If you're thinking about end-of-lifecycle and minimizing footprints, the 2008 Smart Fortwo extensively uses 100 percent recyclable synthetics, and the door panels of the Fortwo can be easily changed--whether they become damaged or for vanity--and recycled. The 2008 Smart Fortwo is a very competent, fun-to-drive city car, not just a novelty, but with so many caveats, most people would be best served by a hybrid or larger small car. To bring you this assessment of the 2008 Smart Fortwo roadster, TheCarConnection.com's experts have handpicked some of the most useful information from reputable reviews. Then to make this especially relevant to shoppers who might be comparing the Fortwo to another model, the editors at TheCarConnection.com have included their own driving observations. The diminutive 2008 Smart Fortwo, the smallest mass-market car sold in the United States, is making its debut in the States for 2008, although it follows a design that's a decade old. All U.S. Fortwo models are powered by a 70-horsepower, 1.0-liter Mitsubishi-supplied three-cylinder engine, with a five-speed automated manual transmission. Like many sportier cars with automatic transmission, it can be shifted with handy paddle shifters alongside the steering wheel or just left in Drive. The interior in the 2008 Smart Fortwo feels very basic, much like a small pickup cab at first, but a surprising amount of headroom--even for those well over six feet tall--and decent legroom, though large or lanky people will be bumping elbows or potentially shoulders because the cabin is so narrow. The driving position is quite upright and vanlike, with short seats, and the steering wheel sits more horizontal than most cars. The instrument panel and controls feel rather cheap and plasticky. In back, cargo space is disappointingly small for the two-seater, with only enough room to wedge three large shopping bags in a row; the front passenger seat can fold forward, but it's an option. The 2008 Smart Fortwo has, no joke, two different personalities behind the wheel. At city speeds of 40 mph or less, the 1,800-pound Smart feels very peppy around town due to its low gearing, peppy powertrain and quick-ratio steering. Although the transmission doesn't always shift smoothly, it's a fun car to drive on tight city streets, especially when it comes time to park. But those same features that make it feel so in its element in the city--the quick steering, short wheelbase, and short overhangs--all work against the 2008 Smart Fortwo on the highway. Although the seating position is on the level of other cars, the lack of much car in front or behind the driver fosters a feeling of vulnerability--even if it is quite a safe car--while the steering and short wheelbase combine to create a choppier, busy ride with twitchy steering that's especially susceptible to crosswinds, bumps, and truck ruts. What's more, engine and road noise become prominent. To the point, the Smart doesn't have the acceleration of most other vehicles; its 0-60-mph time of about 13 seconds is on par with economy cars of a couple decades ago. Fuel efficiency doesn't completely assure that the 2008 Smart Fortwo is worth the sacrifice if you're not planning to be in tight urban spaces most of the time; EPA ratings are 33 mpg city, 41 mpg highway. Two different body styles of the 2008 Smart Fortwo are offered: a Coupe with a fixed roof, and a Cabrio model that has two removable roof panels that allow a more open-air experience. The Coupe is offered in two different trims, Pure and Passion. The Pure gets you only the most basic equipment, with not even a sound system, but it does have keyless entry, a rear defroster, and an outside temperature display. Most will want to upgrade to the Passion model, which gets flashier alloy wheels, a panorama roof, power windows, automatic climate control, and a two-speaker AM/FM/CD stereo. Top options include electric power steering (which isn't really needed on the Smart), heated seats, fog lamps, and a "premium" four-speaker sound system. Perhaps because the Smart is so small, safety features are emphasized. The so-called tridion safety cell provides occupant protection that rivals much larger vehicles, Smart says, and electronic stability control, anti-lock brakes, and side airbags are all standard. The 2008 Smart Fortwo has not been crash-tested in the United States, but current and previous versions of the model have done very well, netting four out of five stars in Europe's Euro NCAP test. 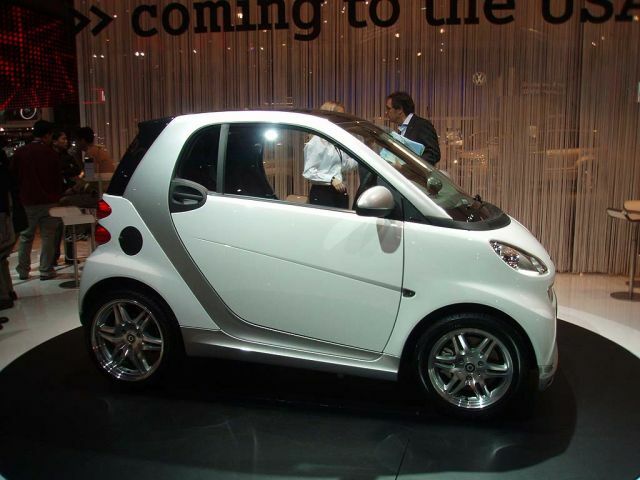 No other car under $20,000 draws as much attention as the 2008 Smart Fortwo. Making its American debut in 2008 is the Smart Fortwo, a European micro car that has been on sale across the pond for the past decade. Despite its small size, the 2008 Smart Fortwo has a visual impact that far exceeds its physical dimensions. The exterior of the 2008 Smart Fortwo is unmistakable, both for its size and its actual styling. Automobile observes, "this street-legal Tonka toy is again very tall, very narrow, and very short." Kelley Blue Book says "the body panels are made of dent-resistant plastic," while Cars.com adds that the design "fuses wraparound panels and extended fenders in an extroverted, ultra-chic package." Cars.com reviewers also write that the 2008 Smart Fortwo "generates more interest among observers than some that cost 10 times as much." All Smart Fortwos feature a "silver or black strip that loops around the Fortwo's side," which Edmunds says is the visual evidence of "the Tridion safety cell." The Smart Fortwo comes "in two body styles," according to Edmunds: "a hatchback Coupe" that "is offered in Pure and Passion trim levels" and a "convertible Cabrio" that "only comes in Passion." Edmunds adds that the exterior of "the base Pure comes with 15-inch steel wheels," while the Passion trim adds "alloy wheels" and "a panorama glass roof" to provide some visual distinction. The interior of the 2008 Smart Fortwo isn't quite as radical as the exterior, but reviews read by TheCarConnection.com approve of the logical layout. ConsumerGuide praises the Smart Fortwo for having controls that "are simple and well laid out," along with "easy to see" gauges and the "unobstructed" speedometer. Kelley Blue Book calls the overall interior styling "unique, but not as quirky as the car's exterior design might lead you to expect." 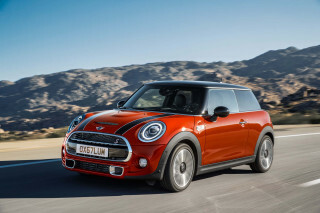 Those same Kelley Blue Book reviewers also find that the "relatively compact instrument panel and open space where you'd expect a center console all contribute to an interior that feels less confined than that of the significantly longer and wider MINI Cooper." Cars.com writes "the cabin has a cartoonish look, with dimpled upholstery on the dashboard and kitschy plastic air conditioning controls" and a dashboard that "curves away as it descends." For those seeking a more customized interior styling touch, Edmunds notes "there are a number of monochromatic and two-tone interior options available to liven things up." The 2008 Smart Fortwo accelerates slowly and labors on the highway, but its frugal engine sips gas at a wallet-friendly rate, though it’s no better than a Toyota Prius. The 2008 Smart Fortwo is small and far from quick. In fact, the only redeeming performance quality of the 2008 Smart Fortwo is the fact that it gets over 40 mpg on the highway, but even that comes at the cost of premium fuel. The 2008 Smart Fortwo, in both coupe and cabriolet form, is available with just one tiny engine. Edmunds writes that a "1.0-liter three-cylinder engine that produces 71 hp and 68 pound-feet of torque" sits inside the Smart Fortwo, which is barely powerful enough to give the Smart Fortwo "a 0-60-mph time of 14.1 seconds." ConsumerGuide says that overall "acceleration is sluggish from a stop and is plagued by annoying bogging and surging at every shift." Furthermore, the Smart Fortwo's "90-mph top speed" and poor acceleration "qualify it as one of the slowest new vehicles on the road," according to Kelley Blue Book. Highway driving in the 2008 Smart Fortwo is always an adventure, and while Cars.com contends "maintaining 65 mph is within the realm of long-haul plausibility," they also note that "climbing an incline at that speed--or accelerating to anything higher--is dicey." The small three-cylinder engine on the 2008 Smart Fortwo comes with just one available transmission, and that transmission is universally derided in reviews read by TheCarConnection.com. Edmunds describes the transmission as "a five-speed automanual" that "is shifted without a clutch pedal via a simple console-mounted stick (and column-mounted paddles on Passion models)." Kelley Blue Book says that "the automated manual transmission" shifts "with all the grace of a backhoe," while Car and Driver writes that the "five-speed" transmission is "a dog off the dime and characterized by the most laughingly goofy gaps between shifts" in full automatic mode. Moving to the "shift-yourself manumatic approach," Car and Driver finds that "the Fortwo can be driven more quickly, but it takes a lot of concentration." While a small engine definitely doesn't provide impressive acceleration, in this case it does offer the benefit of impressive fuel economy. The EPA estimates that the 2008 Smart Fortwo will get 33 mpg in the city and 41 mpg on the highway in either coupe or cabriolet form. Cars.com finds that the fuel economy "figures beat the most frugal subcompacts," though "premium fuel is recommended" for the 2008 Smart Fortwo. Like many cars with short wheelbases, the 2008 Smart Fortwo suffers from a rough ride, especially at highway speeds. ConsumerGuide says that the 2008 Smart Fortwo is "stiff and choppy over all but glass-smooth roads, with sharp bumps and expansion cracks causing abrupt vertical motions." Once on the highway, Kelley Blue Book reviewers find that "the faster you go," the "more skittish the fortwo becomes." Edmunds thinks the Smart Fortwo's "high-speed stability is also pretty good, although strong crosswinds can wreak havoc on its boxy shape." They also warn that "handling largely depends on how one equips the Smart Fortwo," as "a base Pure model with manual steering and narrow 15-inch front tires feels ponderous," while "upgrading to power steering and wider tires provides a more adept driving experience, and actually makes zipping through city streets fun." 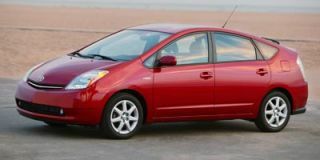 Kelley Blue Book agrees, stating that they had the most fun "in parking lots, where the car's micro measurements and sub-30-foot turning circle combine to deliver an almost comical sense of agility." Another performance positive is the braking on the 2008 Smart Fortwo. When it comes time to stop, Car and Driver writes that the "excellent-feeling brakes" bring the hatchback to a full stop "from 70 mph in 167 feet," with "the ragtop nine feet later." Despite being hailed as an urban alternative, the 2008 Smart Fortwo offers little in the way of functional storage space. The 2008 Smart Fortwo offers the build quality one would expect from a Mercedes-Benz offshoot, as well as a surprising amount of passenger space. The lack of any significant cargo room, however, is a major drawback. The Smart Fortwo can, as its name suggests, seat two inside its tall cabin. Edmunds reviewers write that although the interior is "certainly snug, the Smart Fortwo offers a surprising amount of space for two people." Other reviews read by TheCarConnection.com rave about the ample occupant space, and Cars.com reviewers find that "headroom and legroom are entirely adequate." ConsumerGuide, which is typically very conservative with their praise, says that the "seats are supportive, with good side bolstering," but the "narrow cabin means two adults ride almost shoulder-to-shoulder." They also point out that the "lack of a tilt steering column may compromise comfort for some drivers." While the interior of the Smart Fortwo may be spacious for passengers, that certainly isn't the case when it comes to cargo. In this important category, especially for a car designed for urban driving, Cars.com finds that "cargo room in back measures just 7.8 cubic feet, less than a third the space the Cooper offers behind its front seats." ConsumerGuide also rates the 2008 Smart Fortwo well below the class average for cargo room, saying that it is "meager overall" and claiming that the "tiny glovebox offers barely enough space for an owner's manual." Kelley Blue Book reviewers feel that the "open space where you'd expect a center console" helps contribute to the "less confined interior," but the lack of a console for storing small items might prove annoying. Build and materials quality on the 2008 Smart Fortwo is a bit of a mixed bag. 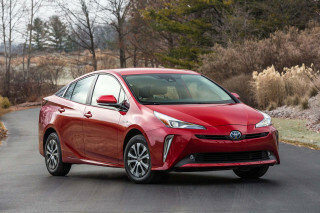 While Cars.com writes that "build quality is respectable," and most reviews read by TheCarConnection.com agree--the materials left some reviewers wanting something a bit more upscale. Like the Cars.com reviewers, ConsumerGuide feels that the "cabin materials are solid and well-assembled," but they also say that the "overall ambiance is budget, with lots of hard plastic and very few padded surfaces." The 2008 Smart Fortwo also features "standard cloth upholstery," according to Edmunds, which certainly doesn't offer any upscale pretense. Aside from some materials issues, the 2008 Smart Fortwo is plagued by excessive road noise. ConsumerGuide says that the ride is "never serene," and while "road noise is relatively well-muffled," the "wind rush is pronounced at highway speeds." They also add that the tiny engine produces quite a bit of noise, and "engine note is always audible and rises to a loud groan under acceleration." The 2008 Smart Fortwo may be small, but it's got a full suite of safety features and impressive engineering to boot. The 2008 Smart Fortwo is, among many other things, proof that looks can be deceiving. One glance at the Smart Fortwo's tiny exterior dimensions will probably leave you wondering if it could withstand hitting a mailbox, much less a full-size SUV. Crash tests show that the 2008 Smart Fortwo can hold its own in some pretty serious impacts. The 2008 Smart Fortwo coupe was recently tested by both the National Highway Traffic Safety Administration (NHTSA) and the Insurance Institute for Highway Safety (IIHS), the two main crash-testing authorities in the United States, and both report impressive results. The NHTSA scores are the lower of the two, but still a respectable four stars for front driver impacts and three stars for front passenger impacts, as well as a perfect five-star rating for side impacts. However, the NHTSA does note that "during the side impact test, the driver door unlatched and opened," which "increases the likelihood of occupant ejection." The IIHS, which typically has a more stringent rating system, awards the 2008 Smart Fortwo a perfect rating of "good" for both its frontal offset and side impact tests. Reviews read by TheCarConnection.com register quite a bit of surprise at the high ratings, which Edmunds attributes to "the Tridion safety cell," which is a "cage of high-strength steel" that "allows the Smart car to withstand impacts as well or better than much larger cars." When it comes to safety features, the Smart Fortwo is again ready to impress. 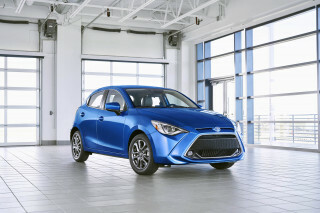 Cars.com reviewers note "standard safety features include front and side-impact airbags--the latter extending upward to protect occupants' heads--as well as antilock brakes, traction control and an electronic stability system." Jalopnik reviewers add that the 2008 Smart Fortwo "is safe," and "it feels safe, too," thanks to a "full retinue of airbags." Thanks to the Tridion system and the fact that all the safety features come standard on every trim level, Kelley Blue Book testers feel comfortable praising the Smart Fortwo's "impressive crashworthiness." Despite its small stance, driver visibility from within the 2008 Smart Fortwo leaves little to be desired. ConsumerGuide says that the Smart Fortwo's "upright driving position prevents occupants from feeling dwarfed by surrounding traffic" and affords "great visibility all-around." Car and Driver also praises visibility from within the 2008 Smart Fortwo, proclaiming "the view out the windshield is panoramic." Yes, it's an economy car, but the standard and optional features on the 2008 Smart Fortwo are still disappointing. Between its mid-30s fuel economy and low base sticker price, the 2008 Smart Fortwo is definitely an economy car. While those attributes may be appealing to many consumers, the economy nature of the Smart Fortwo is, unfortunately, reflected strongly in the standard features list. The cheaper trim of the Smart Fortwo, the Pure, starts at only $11,590. 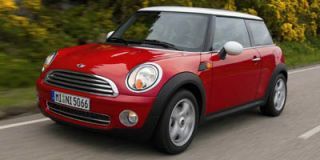 However, reviews read by TheCarConnection.com all mention that the Pure comes with little more than four wheels and an engine. While Edmunds points out that the Pure comes standard with "keyless entry, leather steering wheel and electric window defroster," Cars.com notes "basic amenities like power steering and a radio are optional." The standard features list on the 2008 Smart Fortwo grows somewhat for the more expensive Passion trim level, which Cars.com says "adds a fixed glass roof, alloy wheels, power windows, air conditioning and a two-speaker CD stereo with iPod connectivity." The only difference between the Smart Fortwo Passion Coupe and Cabriolet is that "the Passion Cabrio adds an upgraded stereo with MP3-compatible in-dash six-CD changer." With such a small standard features list, you might expect the 2008 Smart Fortwo to offer quite a few options, but there is little available aside from adding the Passion's standard items to the Pure. Kelley Blue Book says "the 2008 Smart Fortwo's options list includes heated leather seats, a fixed panorama glass roof and a sport steering wheel with paddle shifters." The only other noteworthy optional feature is the available "two-tone paint," according to ConsumerGuide. There are a few conspicuously absent features on the 2008 Smart Fortwo, but Cars.com conjectures that perhaps the most glaring omission is that "cruise control is not available." This car attracts attention and almost always unsolicited comments about its size and the inherent danger of driving on public highways. Until you drive the car using the shift paddles you can't possibly... This car attracts attention and almost always unsolicited comments about its size and the inherent danger of driving on public highways. Until you drive the car using the shift paddles you can't possibly expect anything but being stuffed in to an uncomfortable space without the ability to get out of its own way. Quite the contrary exists if you learn the benefit of select shifting. The car has as many amenities as the typical Mercedes sedan of the same year--everything from remote keying to heated leather bolstered seats. It also accelerates with normal traffic quite easily if you learn how to use the power band with the paddles. The car is then fun to drive every day. Dollar per mile the most expensive car I have ever owned! 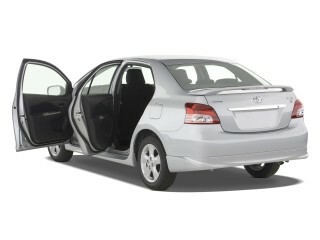 Dependable,fun to drive,fuel efficient and easy to park. Great little car that receives a lot of negative press from people who never owned one or only drove it for a short time. Looking forward to the purchase of the new 453 for 2016.